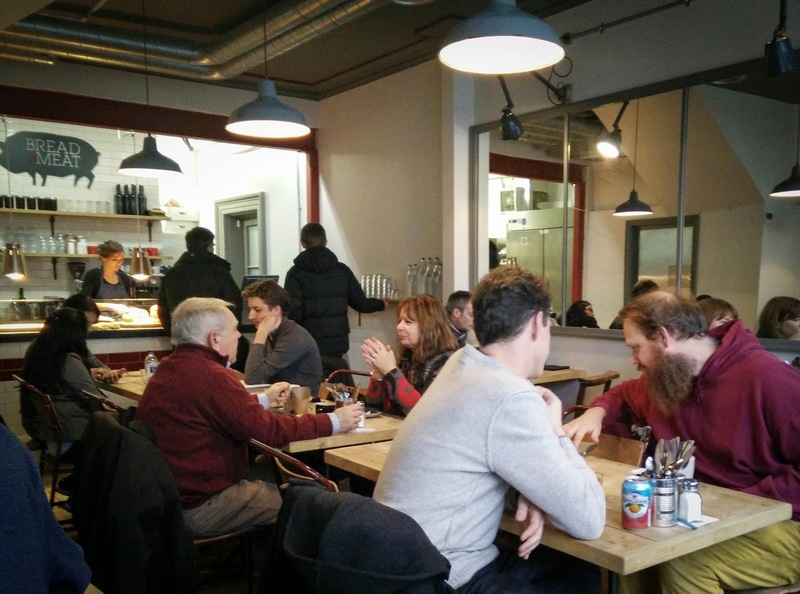 Don't Drive to Dinner: Bread & Meat, Cambridge - A Review. And a Very Good Sandwich. 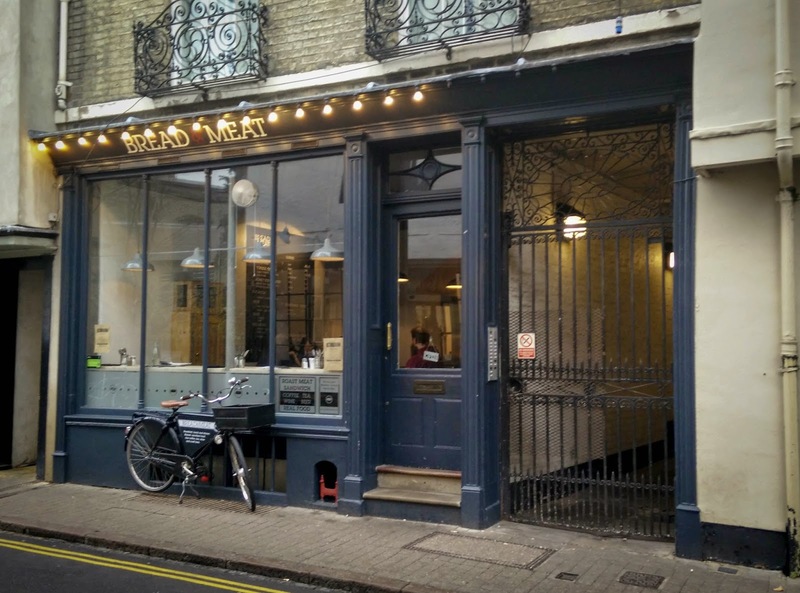 Bread & Meat, Cambridge - A Review. And a Very Good Sandwich. My original title for this post was going to be 'the best sandwich in Cambridge' - but not only would that set off a hyperbole alarm, I worry I'm not qualified to make that judgement. I haven't tried the delicious looking focaccia at nearby Aromi, or the ciabatta at Urban Shed (currently rated no2. place to eat on Tripadvisor!) or the pizza-oven baked breads of Charlie's on Burleigh Street. But I will say one thing for sure - this was a seriously, no joking, not messing, hyperbole free really really good sandwich. Bread & Meat sits in the trendy Peas Hill food quarter, along with independents like Aromi and Smokeworks (and chains like Cau, Jamie's and Zizzis). Sitting there, I was again reminded of the Eriana Taverna (where Smokeworks now resides) - a Cambridge institution with a menu the length of the Old Testament. Now the fashion is towards much smaller, or even single item menus. Flatiron and Burger & Lobster in London leap to mind, or even Steak & Honour closer to home, with its almost zen like simplicity (cheese - or no cheese?). So Bread & Meat is not a classic sandwich bar of old, with tubs of gloopy fillings in a refrigerator cabinet, ready for ladling into your choice of white, brown or baguette. At its most basic, it's simply a choice between pork or beef. Porchetta or topside. There's a veggie option, a daily special, wedges or slaw for sides, but that's it. Now I love restaurants with short menus, because that should mean they've had to a chance to practice, to get it right, to tinker and tune and get their dish close to perfection. Bread and Meat did not let me down. I went for the roast pork - in my mind a sandwich well overdue a re-invention. The novelty of the hog roast at the village fete has long passed - soft white bap, flavourless meat, teeth endangering rock hard crackling, salty grey stuffing and ladles of baby-food like apple sauce. Well let me assure you, if that was the nadir of pork baps, Bread & Meat was its apex. Here we had freshly baked ciabatta that actually tasted of olive oil. Pork that tasted of pig, a lovely mixture of meat and unctuous fat. Light as air crackling, of the sort I wish I could produce reliably at home. And no baby-food sweetness - instead a vinegary salsa verde to cut through the fat. This was an extremely good sandwich - but is it really the top dog (or pig)? 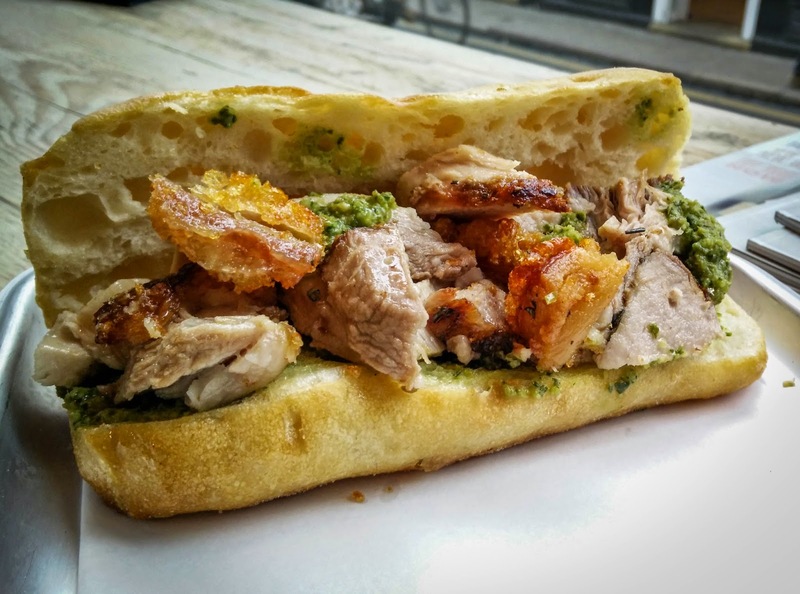 There's a sense we're having a bit of a local sandwich revolution at the moment - and obviously, as a service to you, dear reader, I feel I should try them all so I can feel truly qualified to judge the very best sandwich in Cambridge. Watch this space! Texas Monthly - Best BBQ?